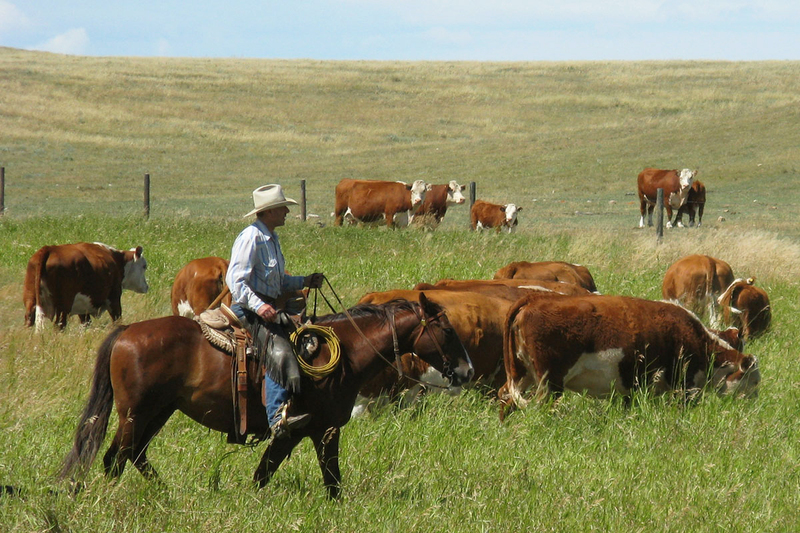 Each year we interview ranchers from across the West about what works best on their place. Understandably, the terrain, weather patterns and ranges all differ, so it’s interesting to read how each outfit has adapted to their unique circumstances. In this issue, we are discussing branding. At our place, I like to gather early and be done branding before it gets real hot in the afternoon. But it seems like we’ve had a bit of a switch in this country in the last, say, 10 years — some of our crew have jobs off of the place, and they can’t get there until late, so sometimes we’re gathering in the afternoons and branding at four or five o’clock. I don’t like that. If you look around any waterhole, the cattle are lying around in the afternoon. In the morning, they’re usually moving and eating —they’re easier to handle in the morning and, yes, everything’s done a’ horseback. Not everything is done to the calves on branding day. When the calves are three or four days old, we catch them, dehorn them and put an ID tag on them. On branding day, they are branded, castrated and given an eight-way shot. I do the least amount of doctoring as I possibly can. Our vet bill is not very big because we don’t buy a lot of medicine. I’ve been saying this for years — I’m not into shooting these cattle full of drugs and implants. It’s not necessary — and you can print that. I’m not very politically correct, and I get into a lot of arguments. Most of the time, we brand here at home. Sometimes it depends on moisture conditions and how we used our grass last year and where our cattle are — and I want to brand in a grass pen. It’s a lot cleaner for the calves you are cutting and for your crew. They’re fairly big pens [half a football field]; a guy’s got to reach a little to rope. We used a wood fire for years, but now it just seems at branding time it’s pretty dry, so nobody’s wanting to light a wood fire because the risk of fire is just too great. So we use propane, but I know that a wood fire sure is the best heat for a good brand. I think the most important job is to get the calves vaccinated. I’ve got two responsible women who come every year, one on each side of the fire. We can have up to six calves stretched out, but I try to get the ropers to slow down a bit because things happen pretty fast when the crew and horses are fresh, and that’s when mistakes can be made. But we’ve got a good branding crew in this country. Something that I’ve really seen change in my lifetime is the number of women in the branding corral now. We lost a lot of our young guys to oilfield and other jobs, but when I was a kid, there was never a woman in the corral. The girls didn’t start showing up until the late ’60s, and now we wouldn’t have a branding crew if it wasn’t for the women. 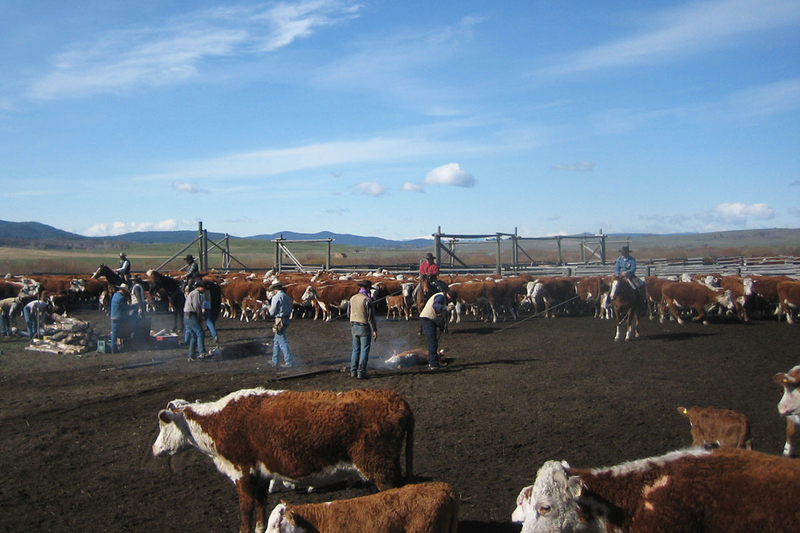 STAN JACOBS: DOUGLAS LAKE CATTLE CO.
We start branding in late April, so when we’re doing an in-field brand, we gather the field to a trap [the ranch has facilities spread throughout the ranch] and brand about 450–500 calves a day. But if it’s a day where we are pairing out of a pasture and moving them to a different location to brand, then we’ll do about 250–300. In total, we’ll brand in excess of 6,000 head each spring. A typical day for an in-field brand is simple: we gather the field into the trap, light a fire and go to branding. For a branding where we are moving: we gather a chunk of that country and pair off what we’re going to do that day — around 250 — move them, put them in the trap, brand them, let them out and pair them up. Generally, we’ll switch ropers about halfway through to give the horses a break and to give the guys a break, too. We only use wood heat for our fires. When we’re having those bigger brandings, we’ll have four Nord Forks on the ground, so it takes about 10 irons. It would take a pretty big propane fire to heat that many irons. I’ve never used propane. We keep 16–18 full-time cowboys here. We run the ranch with a few divisions: the North and the South. 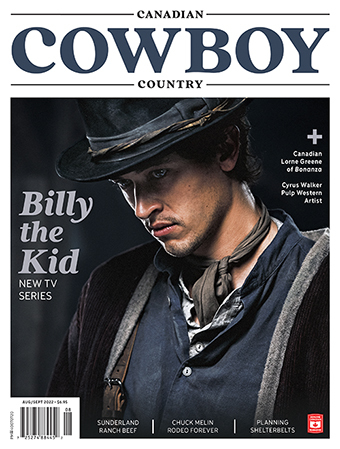 The day we’re branding doesn’t mean all the cowboys are there; they might be working at something else. We can run our smaller brandings with 12 guys, and the larger brandings take about 16 guys. We have a fellow whose job is to deliver the vaccines and RFID tags to the site, and then he bails in and helps. Lots of times our fencing crew helps out when we brand too, but that’s not all that’s going on at the ranch that day.